The kitchen is a vital part of every home, and as such, it needs to be well organized and taken care of. In order to make sure that you have the proper storage solution all set up. You’re going to need separate places for foods, condiments and ingredients, kitchen utensils, as well as other appliances. Large racks, cabinet storage systems, hangers, and drawers are just some of the many storage solutions you’re going to need. If you have your kitchen properly set up, you’ll be able to eliminate clutter and make your overall kitchen experience better and less tedious. Being tidy and organized is more important than you might think, and in this case, it’s even more critical. It’s easy to underestimate the importance of a well-organized kitchen until you actually experience what it’s like to be in a chaotic one. Being one of the more visited rooms in the house, it has to stay clean and organized all the time; otherwise, you’re going to have a tough time keeping track of things. Don’t worry though, once you read this article, you should know how to pimp your kitchen and enhance your overall experience by eliminating all the unnecessary clutter. And now, let us first start by discussing the first aspect of storage you’ll need to have, which is cabinet organizers. Cabinet organizers are probably one of the more essential storage components of any kitchen as they can serve so many different roles, from storing cans, condiments, and leftovers to storing ingredients. Once you upgrade your cabinets and kit them out correctly, the frustration of not being able to find what you’re looking for will be a thing of the past. With that said, there are numerous types of cabinet storage and your needs will eventually determine what you have to buy. If you happen to have a lot of canned goods, you will be better off investing in a can storage rack. These are perfect for organizing your cans and helping you find what you need in as little time as possible. The majority of can storage racks will be turned on their side in a way that allows you to immediately see all of the stored labels without having to dig in deep. When it comes to your spice cabinet, you can get a pull-out spice rack or a rotating spice rack which will significantly limit unnecessary clutter and help you get what you want with as little of a hassle as possible. For your tools and utensils, cabinet storage usually includes storage racks for storing anything else you might need. As such they allow for more usable space for storage. One other thing you want to keep in your mind when investing in cabinet storage is to have a general idea of how much you’re going to store in it. The last thing you want is to spend your hard earned cash on is a storage cabinet that offers little space. Be prepared and don’t cheap out on cabinet storage. Do you spend too much type picking out the ingredient you need without having to sift through a dozen of other components in your kitchen? Well, pantry storage would be perfect to have if you’re facing a similar issue. Pantry shelves are useful for storing all sorts of dry foods, ingredients, and other condiments. Not only that, but they can also be used to sort and organize your tools. 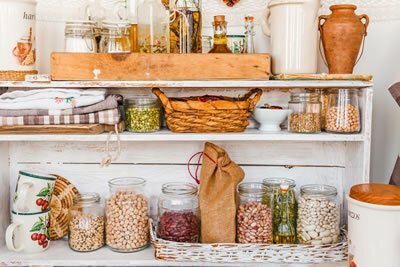 Knowing how to manage and use your pantry space properly can be the difference between a messy, chaotic kitchen and a tidy, clean one. You’d be surprised to see the difference it can make if you use it correctly. It can even offer up new storage opportunities, such as hanging kitchen tools, pans, and even brooms and mops if they’re occupying way too much space. In order to find the most fitting pantry shelf for your kitchen, you’re going to need to take measurements of the pantry space you have so you can invest in something that will make use of all of it. Extra planning and precautions never hurt, and as such, we recommend measuring shelving sections that you intend on getting so you don’t end up with ones that don’t fit. You’d be saving yourself a lot of frustration and headaches that way. It’s safe to assume that most, if not all, of you have been in the situation where the fridge is so cramped and poorly organized that opening it without it dropping anything is a whole endeavor in and of itself. In some cases that might call for a new fridge but in most cases, it’s a matter of organization. While it might seem like a daunting task at first, optimizing refrigerator storage is not as hard as some might make it out to be. In fact, there are numerous refrigerator storage solutions that can alleviate a lot of problems and save you considerable space. For instance, you can get a soda bottle holder and an egg holder for a start, and they can be quite useful. Just like we mentioned before in the pantry storage section, we recommend that you take measurements of your current fridge before you go out searching for storage solutions, so you avoid getting the wrong storage components. It’s best to take these measurements into account so you can save yourself the time and frustration that ensues from buying the wrong storage solutions. If you want a few ideas for simple but effective ways to add storage to your kitchen, watch the video below. These are really easy to implement and cost very little. Those were some of the aspects of your kitchen that you can optimize. Once you buy and install the proper storage solutions for your kitchen, you’ll be surprised at how much better your overall experience will be. It will look cleaner, more organized, and, most of all, more welcoming. Just keep in mind that each kitchen requires its own storage solutions, so do your research before going out there looking for storage components.